Seven summits is proud to offer year-round lessons for all levels of riders. Safety and fun are our top priority and we provide the most reliable school horses and knowledgeable coaching. With Lise’s varied background, focus can be on whatever discipline the student wishes to experience. Working Equitation, Pleasure riding, dressage, jumper and eventing are all possibilities at Seven Summits. Our goal is to help the students meet their goals in a safe and fun environment. Group Lessons are sold in packages of 4 for $170.00 this price includes HST ($10 discount if paid on or before the first). Once ready for jumping students can expect and to alternate dressage and jumping lessons. With an occasional trail ride or working equitation obstacle course thrown in for fun! If a rider does not want to jump that is completely understood. A quick word with Lise and the lesson program can be adjusted to suit the rider’s needs. I encourage all riders to communicate with me what they wish to learn! The experience is meant to help people achieve their dreams. Communication is the key to make sure we understand the dream! Riders can expect to ride for an hour in the group sessions. They should plan on arriving at the barn 15- 30 minutes ahead of the lesson time and staying the same amount of time after the ride. It is important that riders learn about the grooming and care of their equine partner. 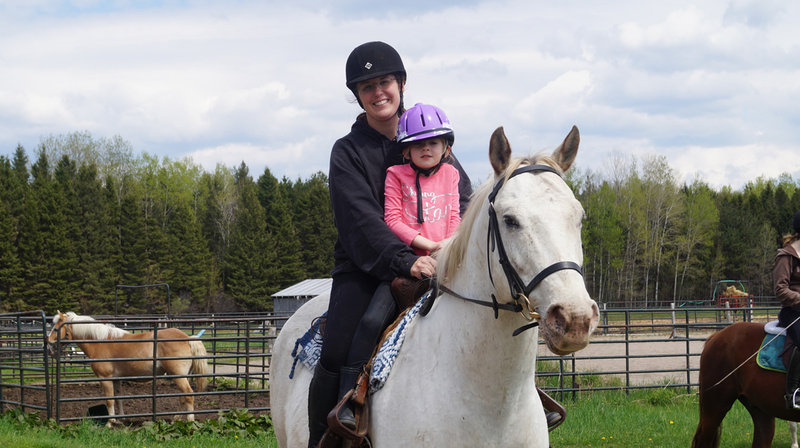 Private lessons are encouraged for first time riders at least for a few weeks to gain confidence and control. We also see the benefit of private lessons especially in dressage for advanced competition riders where instruction is needed every step of the way, especially for the dressage competitors. These private sessions are $80.00 each. They run for 45 minutes with the same 15-30 minutes before and after. Semi-private lessons are also available for $50 per session. there are always opportunities to expand your interests into showing with one of our teams. Part leasing or full leasing. Starting at $300 per month and including lessons. We can also help you to buy a suitable horse of your own if that is the dream. Lise has a good record of matching riders with the right horse for their abilities and aspiration.